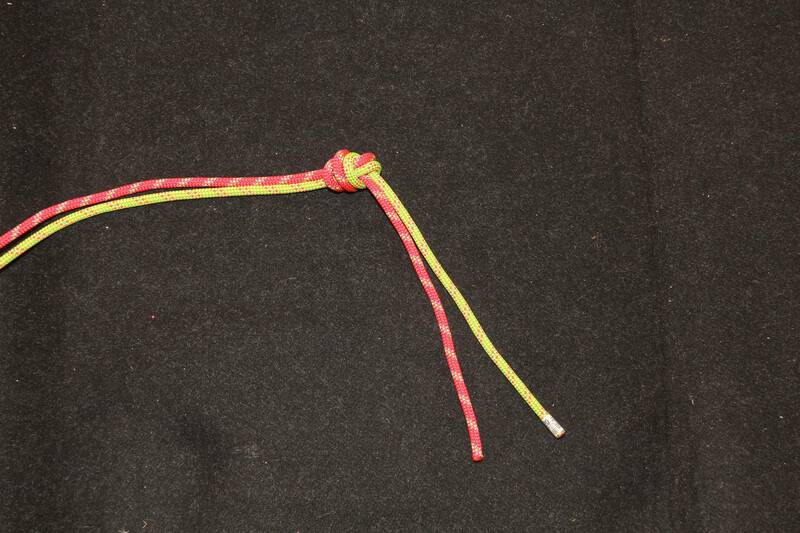 Variation of ABOK #1410 - Offset knot for rappelling (shemlock knot). 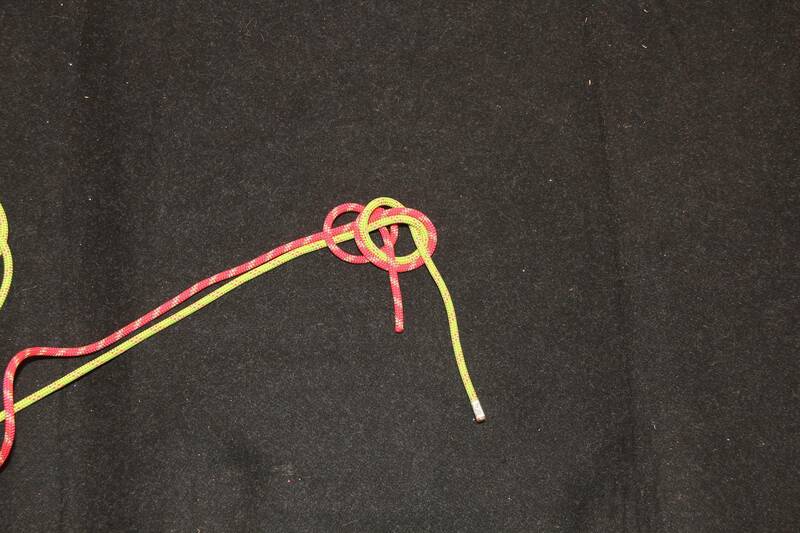 A few years ago I started experimenting with tying offset knots for rappelling in an effort to discover a new knot that would inspire more confidence than the dubious "Euro Death Knot" (EDK) which is a flat overhand (ABOK #1410) used to join two ropes at the end for rappelling/abseiling. After rediscovering several knots already established in Ashley's book, I eventually came up with a variation of #1410 that is a pairing of a single overhand, and a double overhand. It's not that much of an upgrade from a flat overhand, but it feels much more secure than the EDK. 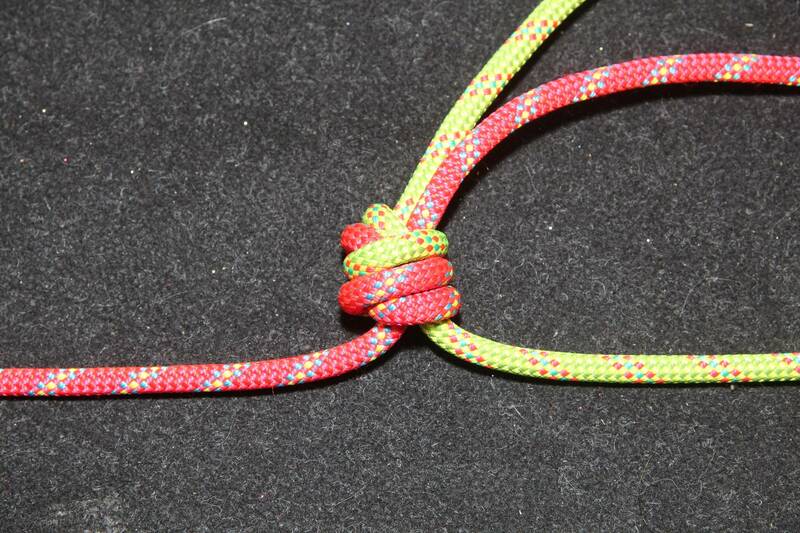 I shared it on another outdoor site about two and a half years ago (https://outdoors.stackexchange.com/questions/9356/whats-this-knot-called), and was just recently introduced to the IGKT. 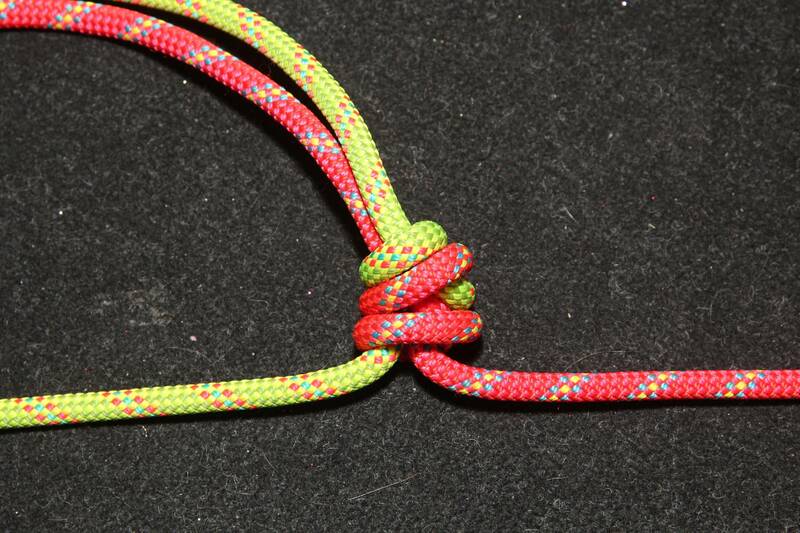 I've searched this forum a bit and found feeds for pairings of other knots, but was unable to find one for this particular pairing. 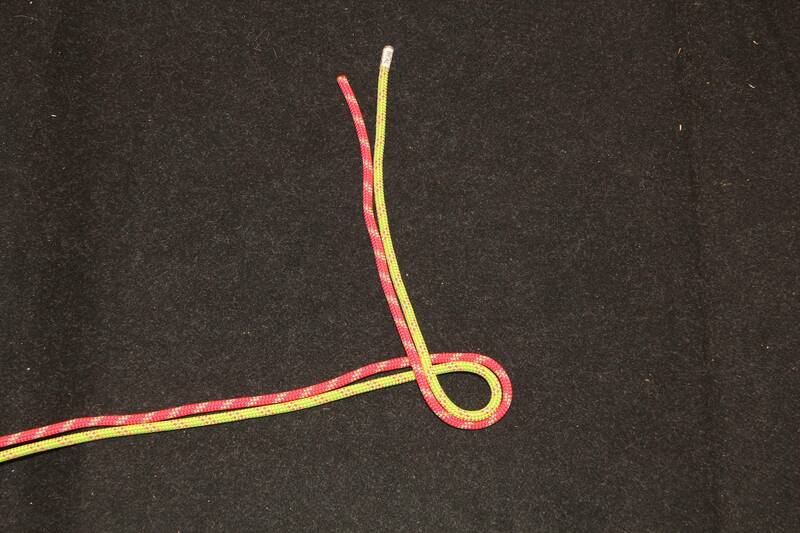 I've been using this knot for a couple years now, joining ropes for rappelling and tying abalakovs. I've shared it with members of my chapter of the Alpine Club of Canada (ACC), and they've dubbed it the "Shem-lock". I was thinking of submitting it to the ACC's newsletter, the Gazette, but would like to determine whether or not this is already an established knot before I do. 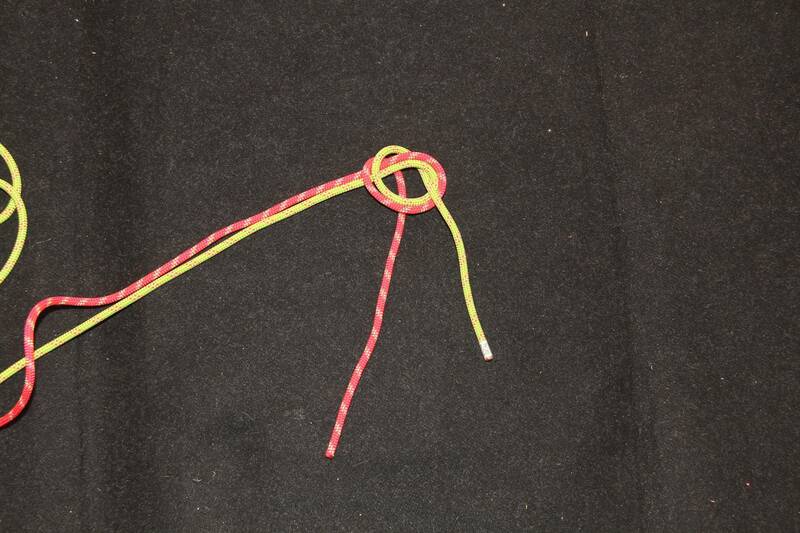 Re: Variation of ABOK #1410 - Offset knot for rappelling (shemlock knot). 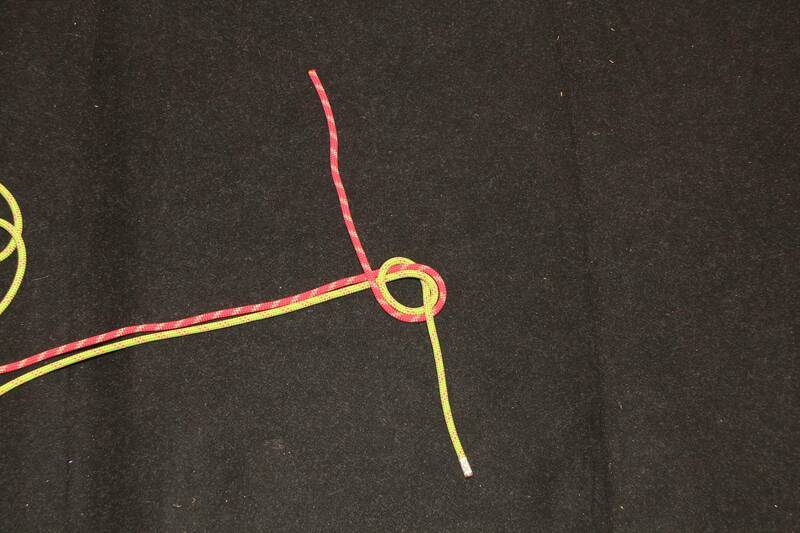 In particular look at page 23: the variation by Mark is the "same" knot dressed with a different geometry. I don't know which "geometry" performs better. Hope this helps and Mark replies soon. Hey Knotsaver, that's a cool document, and that knot is significantly similar, though there are enough differences I think they could be considered two different knots. Mark's knot has the double-overhand dressed differently, my knot has the double-overhand dressed as you would in a double fisherman's, and it chokes the two strands of rope before passing through the single-overhand, which appears to me at least to choke the ropes a lot better, preventing the knot from spreading as much. I'd be interested to see if there are advantages to one variation over the other. I'd also be interested to know when Mark developed his variation, I imagine it was some time prior to publishing his study. I hope he weighs into the discussion, and I'm going to spend some time reading that other feed, thanks for sharing. preventing the knot from spreading as much. 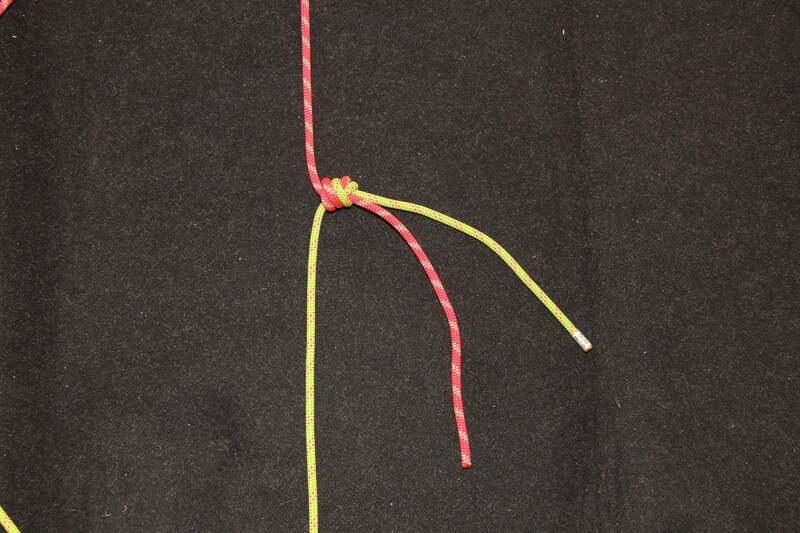 overhand knot around the other tail. when a mere overhand works. require making the right tying decisions at various points. joining ropes for rappelling and tying abalakovs. Ha, I had to Google that term! would be seen as clever force mitigation vs. lousy tying! ... to oblivion ! ! ! The knot's not the only thing going wrong in that picture. The biggest concern is his choice of ice, you want to drill in recesses in the ice, not on bulges. The next concern is you don't want to place your abalokovs near other drill holes. If you don't succeed drilling your holes on your first try you need to pick a new patch of ice. Lastly, but this is just being picky, abalokovs are stronger when the holes are one over top of the other vertically (A-thread) as opposed side by side horizontally (V-thread). So you're calling a 1410 choked below the knot with an extra wrap an offset 9-0h? I'm curious; when did you develop this knot? The feeds shared so far were started coincidentally only a couple weeks after I first shared this knot online: https://outdoors.stackexchange.com/questions/9356/whats-this-knot-called. No doubt we both independently developed this knot, but for vanity purposes I'd be interested to know who came up with it first mostly so I can continue sharing it as the Shemlock . As an aside, you may be interested to know that the Alpine Club of Canada has promoted the use of an appropriately sized link of steel chain below the 1410, to act as a choke and prevent the knot from spreading. 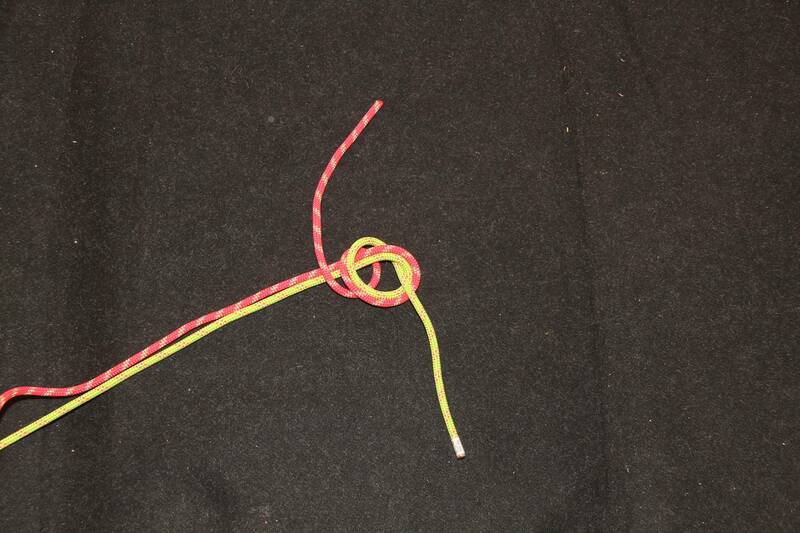 I would advise the Canadian Alpine club to run some load tests of the offset overhand bend (#1410) and observe that under nominal loads of 1 person - the knot remains stable. People seem to forget this small but crucial question...how much load is actually being applied to #1410? In a worst case scenario, such as in a rescue, you could reach loads up to around 2.5kN (approx 250kg). Even at this load, the knot remains stable. I have asked Alan Lee to investigate the load threshold which triggers instability - but something has happened and the testing has stopped? I hope that Alan can regroup and get this important testing done asap. My suspicion is that instability is triggered in the vicinity of 5kN (but this is only a hunch - I need to see the evidence). I wish you would refrain from the totally incorrect use of the term 'flat overhand'. It is not flat. The concept isn't new. As knotsaver has already pointed out - I had tied and experimented with multiple variations of this structure. I dismissed it as a dead-end street because ultimately, it is defeating the very heart and sole (or purpose) of #1410. And that purpose is (in a word) 'simplicity'. This is why I devised my simple solution of adding one extra turn of a rope (refer to my offset knots paper and also attached image). I also experimented with a 'wrapped' #1410 where I had the idea of a prusik hitch and wanted to somehow translate that into an offset rope joining knot (see attached image). So I have come to the inescapable conclusion that if the rope joining knot isn't elegantly simple, it will never develop legs and gain mainstream popularity. So future efforts and work should concentrate on simplicity. So you're calling a 1410 choked below the knot with an extra wrap an offset 9-0h? I'm curious; when did you develop this knot? mostly so I can continue sharing it as the Shemlock . so it was prior that. and which is much a YMMV per materials & forces thing.